With an overwhelming force, General Anthony Wayne led a well-armed force of over 3,000 soldiers that included artillery and cavalry, against an estimated 1300 warriors. Like in many battles, fate played a key role in the outcome of this conflict that became known as the Battle of Fallen Timbers. The Battle of Fallen Timbers, August 20, 1794, has often been called the “last battle of the American Revolution” and one of the 3 most important battles in the development of the United States. The decisive victory by the Legion of the United States over a confederacy of Indian tribes opened the Northwest Territory, a 5-state region given up by the native inhabitants, for westward expansion and ultimately led to Ohio’s statehood in 1803. Just north of the Maumee River where the battle would take place, a tornado had recently blown down many of the trees in the area, hence the name Fallen Timbers. The main participants in the battle were the Legion of the United States led by General Anthony Wayne. George Washington had specifically asked Wayne to lead this campaign after several previous disastrous campaigns in the previous years. General Wayne had retired from a successful military career, but Washington's convictions were so strong, that he convinced Wayne to once again take a leadership role in the defense of his country. Rather than fall into the same trap that his predecessors had taken, Anthony took some time assembling and training his force that he called the Legion of the United States. This was the first professional army of the United States of America and it consisted of 1700 regulars, and 1500 militia members. 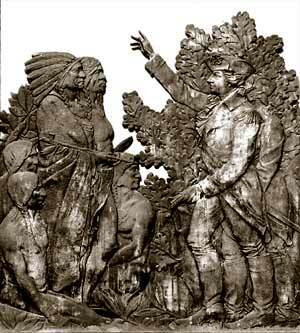 On the other side of the battle was a confederacy of Native Americans led by the Miami chief Little Turtle, Shawnee Chief Tecumseh, and Blue Jacket along with warriors composed of Shawnee, Mingo, Delaware, Wyandot, Miami, Ottawa, Chippewa, and Pottawatomie. Just a few miles north of where the conflict would take place was a detachment of British and Canadian forces at the old Fort Miamis site. The British were under strict orders under no circumstance were they to engage the US military forces reported to be advancing on their position. Indian scouts had warned that a large group of American military were approaching and that an attack was imminent and most likely to happen on the 18th of August. The warriors devised an ambush that they hoped would catch the Americans off guard and thus win another quick victory. As was the custom before a large battle, the warriors began a fast the night before the expected battle. However, the approaching army didn't arrive, and so the warriors fasted a 2nd full day. Scouts then reported that it appeared as though the army would arrive on the following day. With 2 days of fasting, the warriors decided to break the fast for much needed nourishment. It was at this precise moment that General Wayne began his attack. During the hour long engagement, fewer than 100 men on each side would die, but the Legion’s victory marked a major turning point in the battle for the western frontier. 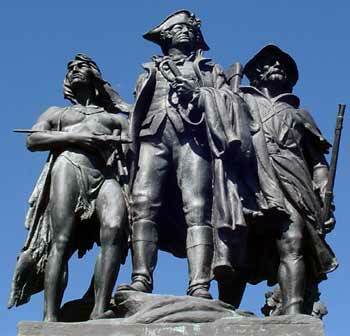 The Battle of Fallen Timbers eventually led to the signing the Treaty Greenville in 1795. It could be argued that without this treaty, portions of Ohio, Michigan, Indiana, Illinois and Wisconsin might have remained a buffer zone between Indian and settled territory, or even become part of British-controlled Canada. General Wayne’s victory at the battle was also the first successful federal military campaign after the Revolution. On the morning of August 20, Wayne's Legion were marching along side the Maumee River from their encampment at Roche de Bout (present day Waterville, Ohio). The Legion was set up in 5 parallel columns, each spaced approximately 200 yards apart. In the center column was General Wayne and his staff, accompanied the army's artillery companies, extra ammunition and supplies, and some light infantry and dragoon companies. On both sides extending some 200 yards of the main column were the right and left wings of the army. Each wing was composed of 2 Sub-Legions of about 10 infantry companies. Beyond each of these columns another 200 yards were columns of Light Infantry and Riflemen. All combined, the army was more than 800 yards wide. Behind the Legion were 1500 or so mounted Kentucky militia. Along the valley crest, the right wing marched through an open woods and were hampered by a number of ravines. The left wing found themselves in dense woods and heavy undergrowth on level ground that was poorly drained. Out in front about 400 yards, a skirmish line of 150 Kentucky mounted volunteers had formed. The right wing, left wing and the skirmish line were about 200 yards in front of the Wayne's main columns. After marching about 5 miles the Kentucky volunteers stumbled into the center of the ambush setup by as many as 1000 warriors lying in wait for them. As the ambush was sprung, the skirmish line quickly collapsed and fell back with the front guard of regulars immediately behind them. Together, they attempted to repulse the attack, but couldn't stop the attack, and they too had to fall back with the warriors in pursuit. The warrior's pressed the attack, a hastily formed Light Infantry skirmish line forced the warriors to find shelter in the fallen trees. Although a sustained fire fight developed along this line, the Legionnaires were still being slowly forced back some 80 yards from their initial contact point. As the developing skirmish continued, the remainder of the Legion deployed into a battle line. This maneuver required each company to un-double its long files while simultaneously moving forward and obliquely to the left to form up to the left of the preceding company. On the right wing, the 1st and 3rd Sub Legions formed a single line, and on the left, the 4th Sub Legion formed on their battle line, with the 2nd Sub Legion formed as a reserve. During this 15 minute skirmish, only the Light Infantry and Artillery companies in the center column had joined the battle. The Artillery quickly opened fire with shot (shot is a group of small pellets fired with single blast) and shell (shell usually refers to solid piece of iron-- a cannon ball), then switched to canister (a casing of small pellets and pieces of iron that would explode using a fuse) as the warriors pressed to within about 80 yards of the Light Infantry and Artillery positions. As the fire fight spread along the length of the U.S. line, Dragoons were ordered to ride to the river and flank the warriors. This charge, lead by Captain Robert MisCampbell, originated from the crest of the bluffs, but may have carried into the prairie below. MisCampbell was killed almost immediately and the cavalry charge quickly faltered under heavy fire from the concealed warriors. On the left side of the line the reserve (2nd Sub Legion) was ordered forward to extend the line and protect the left flank. Before this move could be completed the entire Legion was ordered to charge. The charge wasn't contested except on the left of the U.S. line where a party of Wyandots and a few of the Canadian Queen's Rangers that had accompanied the warriors from Fort Miamis, attempted to fight a delaying action. The warriors suffered heavy losses before being driven from the field. To the right, some of the Light Infantry were ordered into the flood plain, but were quickly recalled to the uplands due to their inability to get forward through the tall grass. As the charge developed the mounted Kentucky militia was ordered forward to extend and cover the left flank, thus extending the battle front beyond that formed by the infantry itself. The thick woods slowed their progress and prevented a major extension of the U.S. front, however, clearly once the charge was underway, hundreds of mounted men were moving forward on the left flank of the Legion's line. Wayne's charge carried the army 1 - 2 miles downstream and was stopped when the resistance from the warriors stopped and the charge became disorganized. As the Native Americans fled the battle, a small group of Wyandots and Canadian militia fought a rear-guard action to slow down the advance of the Americans. When Colonel Campbell at Fort Miamis heard the firing coming from the engagement, he ordered is men to arms, and to close and secure the gates. When the fleeing indians reached the fort, Campbell refused them entry. Unable to seek refuse there, the indians pressed further north and they dispersed into the woods. The Legion was brought to a halt, reformed and remained in a defensive posture for several hours. No counter-attack by the warriors developed. The army moved to the high ground overlooking the rapids and within sight of Fort Miamis and its garrison. There they made camp. This concluded the Battle of Fallen Timbers. Wayne remained in place not far from Fort Miamis. During the night the Americans burnt the nearby Indian villages to the ground. Colonel Campbell sent a flag of truce to Wayne asking about his intentions. Wayne replied that his intentions should be perfectly clear from the firing of his muskets the day before. However, neither the British nor the Americans were in a position to engage each other and they remained at a stalemate. On August 23, Wayne began withdrawing from the area. Exact numbers of killed and wounded warriors could not be accurately determined because the Native American's would often remove the dead from battle sites. But it was estimated that some 70 warriors, 2 Canadian militia, and 30 U.S. Legion died during the battle. Soon after this battle, the native tribes in Ohio sought peace with Americans when they realized that the British could not be counted on for support when it was needed most. The indians discovered that they were merely being used by the British to antagonize the Americans by fomenting hatred and supplying that hatred with weapons. The monument was placed on the high ground of a bluff overlooking the Maumee River. For 70 years it was believed to be the site of the battle of Fallen Timbers. An event which would open the old Northwest territory making possible the creation of our State of Ohio. The park surrounding the monument is simple, quiet and restful. It honors both sides of this conflict between the American Legion and the American Indian Confederacy. 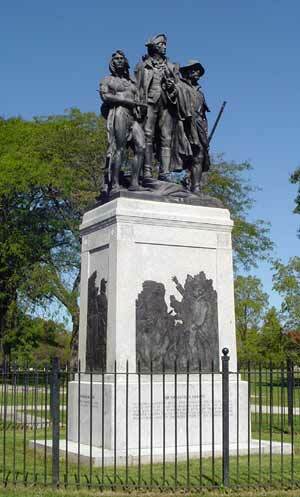 Within this park stands a small bolder used by the Ottawa Chief Turkey Foot to rally his warriors before the Battle of Fallen Timbers. When the fighting had ended the wounded Chief was returned to the rock where he would die. Generations of the Ottawa Nation made pilgrimages to this ground honoring their Chief and leaving behind upon the rock their gift of tobacco. Anthropologist G. Michael Pratt, a faculty member of Heidelberg College, believed the Battle of Fallen Timbers actually took place 1/4 of a mile away from the location it had traditionally believed to have occurred. In 1995 his archaeological survey proved this to be true when they conducted an extensive archeological survey of that land. This preliminary study led to the land being purchased to protect the site. Today the site is yielding rich archeological finds which will help tell the story of this most important North America battle. Currently the battlefield is off limits to the public but in the near future a bike and pedestrian path will tie together the monument, battlefield and Fort Miamis. Watch for updates! In April of 1794 the British ships Spitfire and Brazen arrived to support the building of a fort on the north shore of the Maumee River. It would take most of the summer but when completed its 20' high walls supported 14 various types of cannon. In August of 1794 Major William Campbell and approximately 200 British soldiers took command of Fort Miamis. The fort was not created for protection against the Indians, but rather as a provocative move against America. England had just begun preparing for a war she would fight in the not to distant future. The Indians, however, believed that war was now and they choose to strike at General Wayne and his American Legion advancing from the south. Fallen Timbers was not far from Fort Miamis and the Indian Confederation believed if needed, the British fort would back them up. “You are painted too much, my children, and I can not let you in”. General Wayne and the American Legion advanced to within a mile of Fort Miamis before making camp for the night. The Indian warriors slipped away into the forest. On August 21 a message from Major Campbell was delivered to General Wayne. “In what light am I to view your making such near approaches to this garrison?”. Wayne's reply was for Campbell to evacuate this fortification. Campbell decided that he could not leave the garrison without written orders from his commander. In the early morning of August 22 the American commander slowly rode alone toward Fort Miamis. When he was within pistol range he circled the entire perimeter of the fort while insulting the men behind its walls. After completion of the inspection, General Wayne knew that it would be impossible to take the fort without tremendous loses. However, during his verbal tirade, the Indians had quietly watched from the forest and were impressed by the bravery of this American. They concluded the British were weak and could not be trusted. The Americans on the other hand should be feared. This was yet another of the historic events leading the signing of the Greenville Treaty.